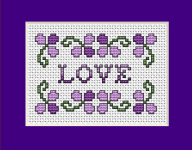 Enjoy your Valentine's Day with this miniature design for greetings cards, depicting a heart of flowers and a cute ladybug. 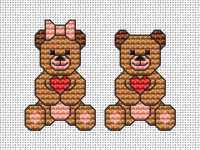 Small design of cute teddy bears - a girl and a boy - holding hearts.Suitable for Valentine's Day cards. 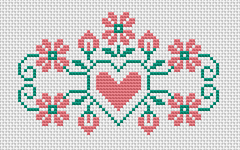 A composition of beautiful pink flowers and buds designed for cards making.The chart contains the text:"With love"
Cross stitch border consisting of elegant pink roses. 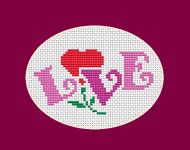 Adorable pattern of a heart-shaped flower forming the word "Love".